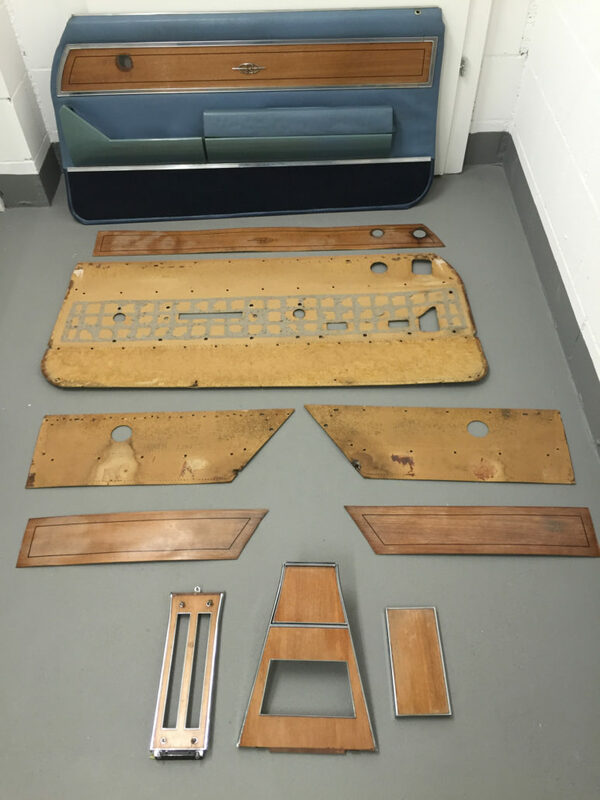 Rebuilding the door panels on your beloved Riviera is not that difficult. You have several choices… You can buy reproduction door panels at www.opgi.com, or have a local upholster take on the job or do it yourself. I choose to do it myself, which I believe is more satisfying. Although I have very little experience with a project like this it got done and I’ll share the steps I took. Before you start, it makes sense to get all the materials you need to create your new panels. Instead of the cardboard backing used originally, I used 2mm birch plywood which is more durable, stiff enough and will not lose its form or strength so easily if it gets wet. I ordered the vinyl in the original pattern and color, as well as the looped carpet for the lower area of the doors from www.smsautofabrics.com. The material is also available from others, including Clark’s Corvair an ROA member, listed in the classifieds. Regardless of where you find what you need, request samples to insure you get the right colors and pattern. After you remove the original panels from the door the next step is to remove the veneer panel, held on by small clips and covered in part one of this series. Next is to remove the arm rests and extended control panels, which appear in the deluxe interior. 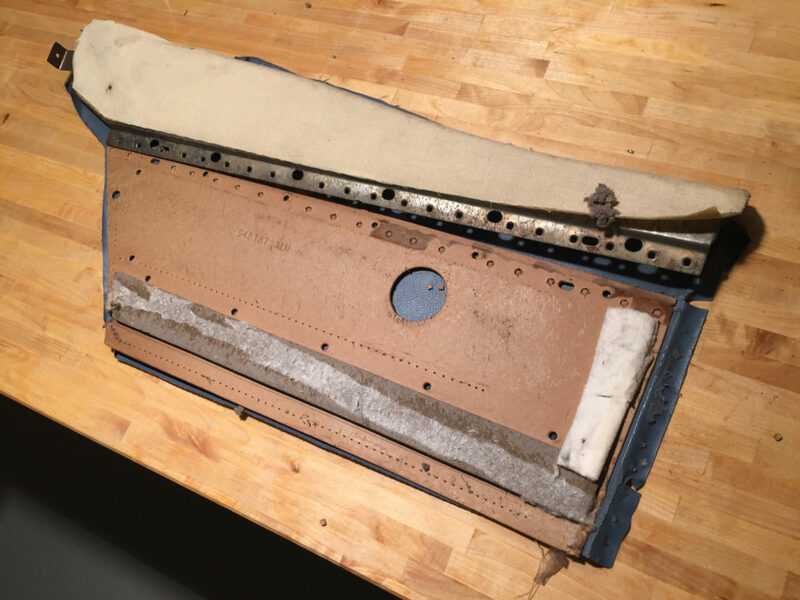 Buick used a cotton material as a backing between the vinyl and the cardboard to give if softness. You will notice that the cardboard back-ing is attached to a curved metal frame along the top. Pictured is how the rear panel is attached to the metal top (Fig 1) It is important that when you separate them you do not destroy the cardboard. 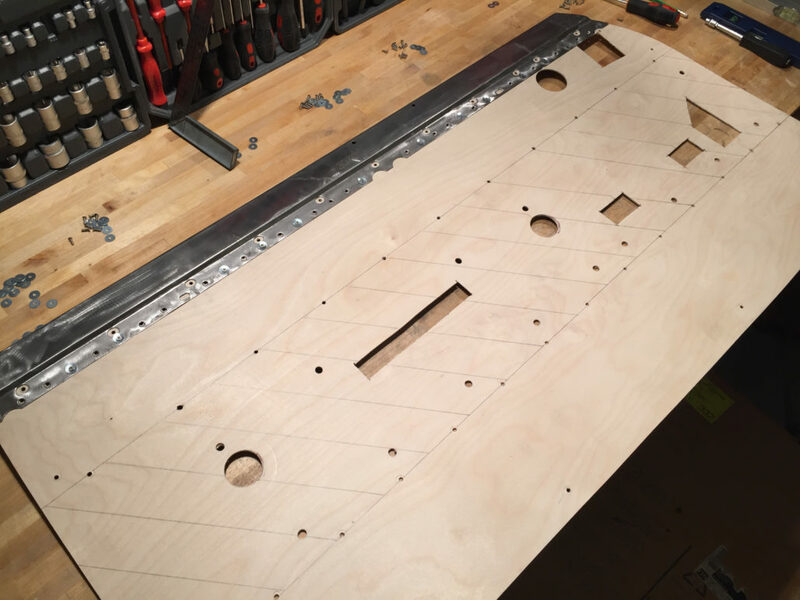 They will serve as templates (Fig 2) to mark the many holes and openings in the new panel. I clamped the old panels to the plywood sheets to mark the shape, openings and holes. Using a jigsaw I cut the outer shape and drilled out all the holes (Fig. 3). I used strong clamps to cut and drill two panels out at the same time. 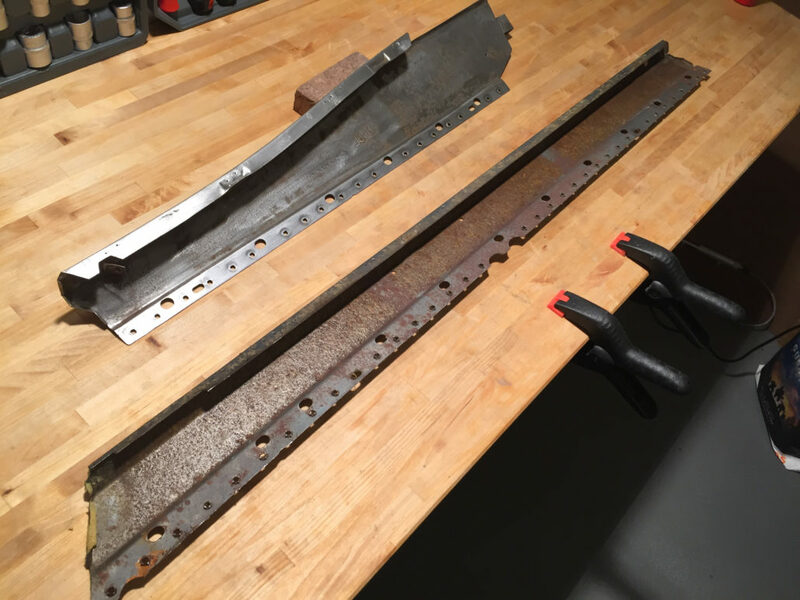 You may need to clean any excess deposits around the holes and if necessary, grind rust off the metal frame, before attaching the new plywood. This photo shows before and after cleaning (Fig 4). To attach the wood panel to the metal I used small rustproof stainless steel nuts & bolts. We call them “inox” for inoxidable metal screws. I then ground off the excess tips (Fig 5). To make the panels a bit more rigid, I recommend attaching a 2cm wide frame using 4mm thick plywood around the sides and bottom. It can be attached with white wood glue and a stapler. (Fig 6). The old panels used a metal strip with small hooks to hold the vinyl and with longer pins to attach the panel to the door. (Fig 7) My strips were so rusty and deformed I had to create my own. I used screws of the same length and thickness as the long pins. The threads on the screws worked exactly like the grooved profile of the pins to hold the panel on the door. There are five pins on each side edge of the panel. (Fig 8). The trick here is that the screws need to be the exact length and placed at the exact location as the original pins. A very ac-curate measurement is required! I used the original cardboard to get the exact placement and with a fine drill (1.5mm) inserted the screws. I strongly suggest placing wine corks on the tip of each to avoid injury to yourself or scratches to your work area. I did not duplicate the small hooks. In part two I will show how the vinyl will be placed over the screws and glued. In the next article I describe how to cover the door with vinyl, add carpet at the bottom.